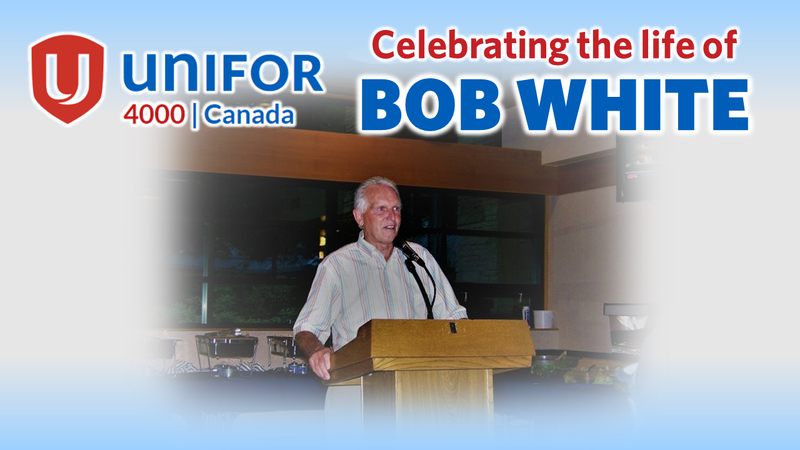 This Friday, the Canadian labour movement comes together in Toronto to celebrate the life of a true hero from among its ranks, Bob White. Before becoming president of the Canadian Labour Congress in 1992, White was the founding president of the Canadian Auto Workers, one of the founding unions of Unifor along with the Communications, Energy and Paperworkers Union. White’s involvement in the labour movement began as a teenager when, against his father’s advice, he became a shop steward at woodworking factory in Woodstock, Ontario. He rose to be Canadian Director of the United Auto Workers before leading Canadian workers out of the international union to form the CAW in 1984. The celebration is open to the public and media and is jointly organized with the White family and the Canadian Labour Congress. It falls on the eve of the CLC convention in Toronto, and will include brief remarks from labour leaders and White's family, before a reception at the Metro Toronto Convention Centre.